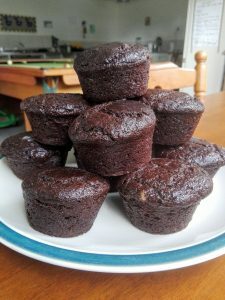 Serves 10 people or makes 18 muffins. Preheat oven to 180 deg. Coat 2 x 20 cm tins with cooking spray and flour. If you’re making muffins then do this to 2 muffin trays. Shake off excess flour. Combine chocolate pieces, cocoa powder, and three tablespoons of water in a heat-proof bowl. Place bowl over a pot of simmering water, gently stir until melted and combined. Remove from heat. In a large bowl, combine both flours, cinnamon, salt, baking soda and baking powder. In another bowl, whisk together the olive oil, water, vinegar, avocado and sugars. Add the wet ingredients to the dry ingredients. Whisk until fully combined and smooth, scraping sides of the bowls completely. Divide batter between both baking pans. Bake in preheated oven for 45mins (approx. 20mins for muffins), until a toothpick inserted in the centre comes out clean. Allow to cool completely before frosting or dust with icing sugar. For the frosting on special occasions: Puree the avocados in a food processor for about 2 mins until smooth. Add icing sugar, cocoa powder, and cinnamon. Puree for another 30secs until combined.